As you might know, only a couple of sports - like football - have financial help and support. There are thousands of amateur (and courageous) athletes out there, who have to work, train, go to competitions, sleep, and find some time to have some sort of a personal life. And the day only has 24 hours. Each time you buy men's underwear at Hatitude, the first thing you do is to choose the athlete you want to help. You can search athletes by name, region or sport. After choosing your athlete, of everything you buy, 25% of the value will be delivered to him. This way you not only get your underwear (made in Portugal, high quality stuff) but you have also helped an athlete. 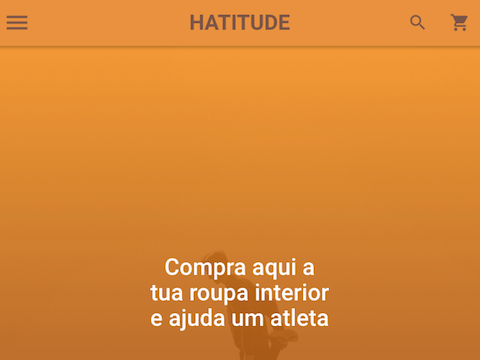 If you're an amateur athlete, you can now sign-in at Hatitude and request to be added to the list of athletes. Hugo will guide you through the necessary steps, and have you added to the system. Afterwards, you'll get your unique URL, and you just have to pass it through your family and friends. Currently, the website is focused on helping only Portuguese athletes.